There are so many things that tend to make us feel fat, including super models, insulated winter coats, funky mirrors, and our own clothes. It's so not fun to put on your favorite jeans and feel like they were dried 3 times on high heat before being placed on our dresser. We all know how what its like for our pants to feel like they are painted on because they are ‘freshly dried’, which usually goes away quickly as the material kindly stretches back out. But what about when those jeans feel like they are cutting us in half at the waist, and the discomfort continues to increase more and more as the day goes on. Have you really gained weight TODAY or are the foods you are eating causing moderate to severe stomach bloat? It’s sad, but true, that your waist can measure several inches bigger in the afternoon than in the morning due to bloating and…IT HURTS! 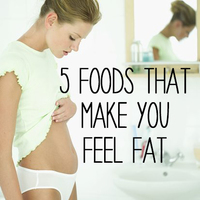 What’s worse, even some very healthy foods can cause you to feel bloated and fat...that’s just not right! Overeating is a big culprit of feeling bloated — in particular, rich and fatty foods take much longer to digest than lean protein and fresh fruits and vegetables. Eating too fast is another factor in bloating, so enjoy each bite at a leisurely pace and don’t gulp your drinks either. Although it varies by person, many types of food are difficult to digest causing, you guessed it, flatulence, discomfort with your clothes, and stomach pain. These issues can be extremely infrequent or quite frequent, unfortunately. It really stinks if you are sensitive to several of these items, pun intended. Legumes: Beans, (that’s right, you remember the rhyme…beans, beans, good for your heart, the more you eat ‘em, …) and lentils contain sugars, oligosaccharides specifically, are not easily digested and must be broken down in the intestines by good bacteria. The good news is that legumes can be a very healthy food and legumes can be sprouted to make a delicious addition to salads, sandwiches, and soups. Once beans are sprouted they are easy to digest and avoid causing bloating or gas. Yay for you (and those around you). Cruciferous Vegetables: Things like Brussels sprouts, cabbage, and cauliflower can also cause bloating and gas. Sweeteners: Artificial and some natural sweeteners are other frequent causes of gas and bloating. Many sugar alcohols and artificial sweeteners like sorbitol are hard to digest and can make you regret eating even a protein bar within minutes. One of the natural sugar sweeteners, fructose, is difficult to digest and causes many people to experience diarrhea and bloating. Try to identify specifically which of these ingredients are an issue for you and then avoid that. Dairy: For people suffering from lactose intolerance, dairy products are the source of intestinal distress and bloating. Avoid milk, cheese, yogurt, ice cream, and similar dairy products to reduce the risk of bloating and discomfort. Lactose intolerance can be a painful condition, but is easily controlled by eliminating dairy products from the diet. Lactaid or other products can provide temporary relief if you just want to have an ice cream once in a while and not suffer the consequences. Whole Grains: Surprisingly, whole grains, in spite of their many health benefits, also cause discomfort for some people because of the high fiber content. When people start adding a bunch of fiber to their diet it can cause gas, bloating, and as an extra bonus, constipation (cue the stabbing abdominal pain). So, be sure to gradually introduce additional fiber into your diet, and drink a lot of water. Fiber absorbs water easily and drinking plenty of water and other liquids helps push the fiber smoothly through the digestive process, reducing the amount of bloating and constipation. Gas and bloating can be symptoms of bigger problems, or simply a temporary blip on your radar. Either way, they are not fun and can be quite painful. These issues seem to increase with age and also seem to increase for some people when flying. So, definitely be prepared when you travel by trying some of the above recommendations. You may also want to try some of the following products for effective, temporary relief. Make sure you keep them in your carry on for easy access. What foods make YOU feel fat?